Location: The Left Coast, a pretty good place to be. Reminiscent of another photo I once posted, this one is the sad result of nature at work. 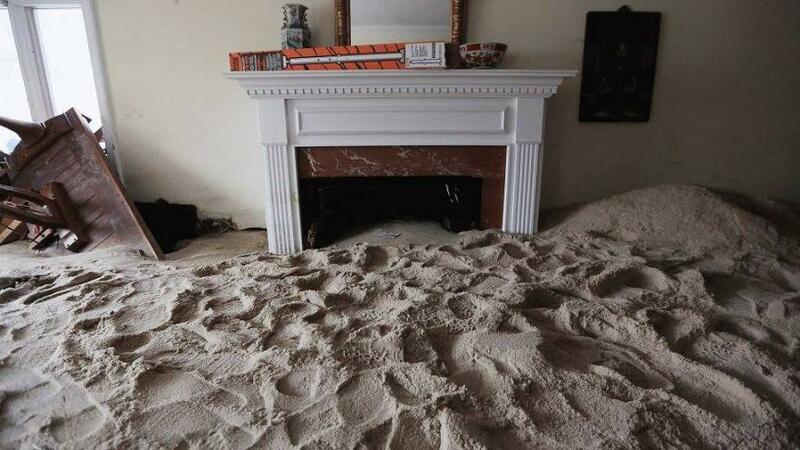 It is a living room filled with sand washed in by Superstorm Sandy in Point Pleasant Beach, New Jersey, November 14, 2012. What about Thanksgiving and the lovely tall Christmas tree that has always been reflected in the mirror . . . . It sure has given me pause for thought . . . This is photo #32 in a series of photos about weather on The Weather Channel. The irony being that with the storm being named Sandy, the thread title has two meanings. Odd to see what might be a piano tossed upside down on the left and the china pieces sitting serenely on the mantelpiece. I have. It's painful and you have to keep blowing your nose for hours afterwards. What a completely vexing nightmare. I can easily imagine the local authorities refusing new house permits. So what happens then? oh, that would depress me no end. I'd have to move. to a condo on the Cape.